Fifty-four percent of registered voters said they support the 2015 international agreement. Republican backing fell to 43 percent, from 53 percent in April. Sixty-nine percent of Democratic voters support the deal, up from 65 percent five months ago. Public support for the Iran nuclear deal remains steady, according to a new Morning Consult/POLITICO survey ahead of an Oct. 15 deadline for President Donald Trump to declare whether the Middle Eastern country is in compliance with the accord’s framework. In the online poll — conducted Sept. 22-24 among 1,987 registered voters — 54 percent of respondents said they were in favor of the agreement reached in 2015 between former President Barack Obama, Iranian leaders and the heads of six other countries and the European Union to lift economic sanctions against Iran in exchange for its pledge to halt efforts to develop nuclear weapons. Voter support was down 2 percentage points from a similar April poll, but still within the 2-point margin of error for the two surveys. Twenty-eight percent of registered voters this month said they opposed the deal, down 1 point from April. 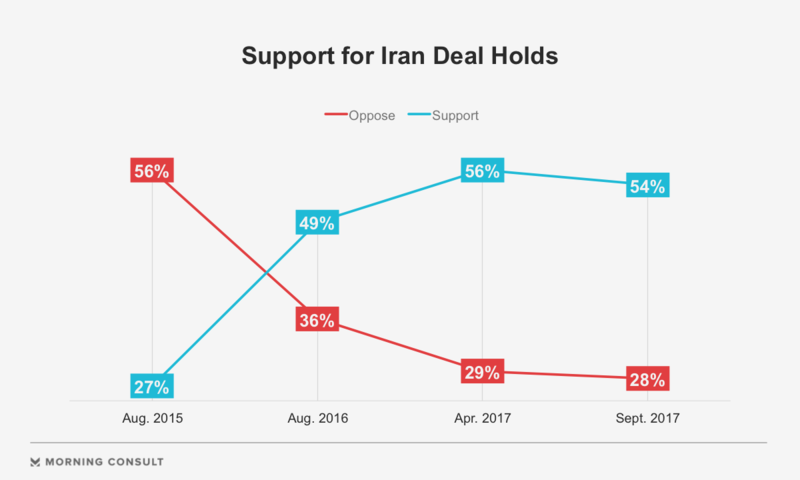 Support for the deal follows an uptick earlier this year, which coincided with the Trump administration’s decision that Iran was in compliance with the terms of the agreement. In this month’s survey, 69 percent of Democratic voters supported the deal, compared with 65 percent in April. Support from independents dipped to 46 percent, from 48 percent five months ago. Despite confirmations from Trump administration officials that Tehran is complying with the deal, the president has continued to rail against it, calling it an “embarrassment to the United States” during a Sept. 19 speech at the United Nations General Assembly, prompting concerns among many Democrats and some Republicans that he may abandon the international accord. Thirty-seven percent of voters said they prefer that Trump recertify the deal, with 34 percent saying he should decertify it and let Congress decide whether to reimpose sanctions — effectively killing the deal. Fifty-one percent of Democrats were more likely to back certification, compared with 50 percent of Republicans in opposition and 34 percent of independents opposed. Sen. Chris Murphy (D-Conn.), who also sits on the Foreign Relations panel, pointed to the rising tensions with North Korea in arguing that Trump should certify the Iran agreement. It would be an epic international disaster if they were to decertify or refuse to extend sanctions waivers. Over the past few weeks, security matters have become more important in the eyes of voters, with 22 percent now calling it a top issue, compared with 18 percent in an Aug. 24-28 poll. During that same time period, the share of voters who ranked economic issues as their top concern fell 6 percentage points to 24 percent, while health care rose 3 points to 24 percent. In the most recent survey, 50 percent of registered voters — up 10 points from July — rated North Korea as the top threat to U.S. national security, followed by 18 percent who said the same about the self-proclaimed Islamic State terror group, 14 percent who picked Russia, 6 percent who said China and 2 percent who chose Iran. Forty-seven percent of voters said they had a lot or some confidence in Trump to handle North Korea, while 48 percent said the same about Trump dealing with Iran. If Trump chooses to decertify the Iran deal, Congress should refrain from scrapping the overall agreement, according to Murphy. “My hope is that Republicans would see the danger of reimposing sanctions and shelve that conversation,” he said. Corker, who told reporters in January that he preferred to strictly enforce the deal rather than tear it up, said he was confident Congress would make the right decision if Trump opts for decertification.